PHILIPSBURG–The Committee of Ministers of the Council of Europe has decided not to follow the regular standard procedure, but the much severe so-called “enhanced” execution procedure following the ruling of the European Court of Human Rights in the case of St. Maarten businessman Francesco Corallo against the Kingdom of the Netherlands. 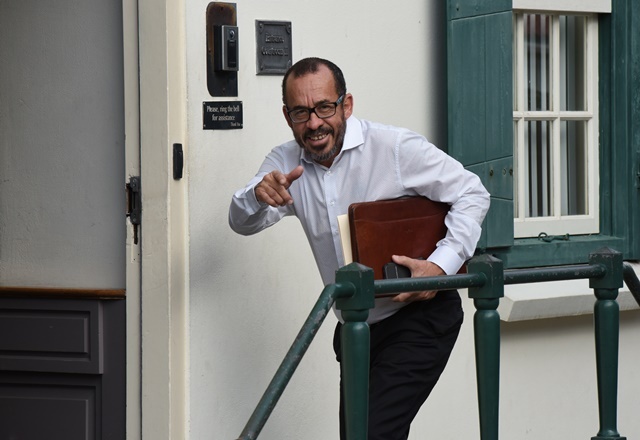 According to Corallo’s lawyer Eldon “Peppie” Sulvaran, the enhanced execution procedure means, in short, “heavy and intensive supervision on the measures the Kingdom must take to improve detention conditions in St. Maarten. As the ultimate remedy in the event of inadequate fulfilment of the obligations, the Kingdom may be facing a direct instruction “aanwijzing” in these proceedings, which the Kingdom is then obligated to follow immediately,” Sulvaran explained. In October 2018, the European Court of Human Rights in Strasbourg, France, condemned the “inhumane” detention of Italy-born casino boss Corallo, who was held at the police station in Philipsburg for months pending his extradition to Italy on charges of money laundering and tax evasion. According to the Human Rights Court’s ruling in the “Corallo vs. the Netherlands” case, the Kingdom of the Netherlands violated Article 3 of the Convention for the Protection of Human Rights and Fundamental Freedoms. The Court awarded Corallo 5,000 euros in immaterial damage and 5,500 euros for costs and expenses incurred before the Court. Article 3 of the Convention reads that “No one shall be subjected to torture or to inhuman or degrading treatment or punishment.” According to Corallo’s legal team, their client had been tortured for months. The European Committee for the Prevention of Torture and Inhuman or Degrading Treatment or Punishment CPT established in 2015 that no one should be allowed to be detained in police cells for more than three days, and in any case no longer than 10 days. According to Corallo’s lawyer this is the first time in history that the enhanced procedure will be imposed on the Netherlands. “In general, Eastern European countries are hit with such severe instruments. It is a ‘bloody shame’ for the Netherlands that it must answer to human rights violations at an international level,” Sulvaran stated. Corallo’s defence team in this case, which besides Sulvaran comprises attorney-at-law Claudia Reijntjes-Wendenburg, said it was “satisfied” with the decision made by the Council of Europe’s Committee of Ministers. On April 11, Netherlands State Secretary of Home Affairs and Kingdom Relations Raymond Knops and Dutch Minister of Legal Protection Sander Dekker visited the Simpson Bay Substation, Miss Lalie Centre, Philipsburg Station and the Pointe Blanche Prison. 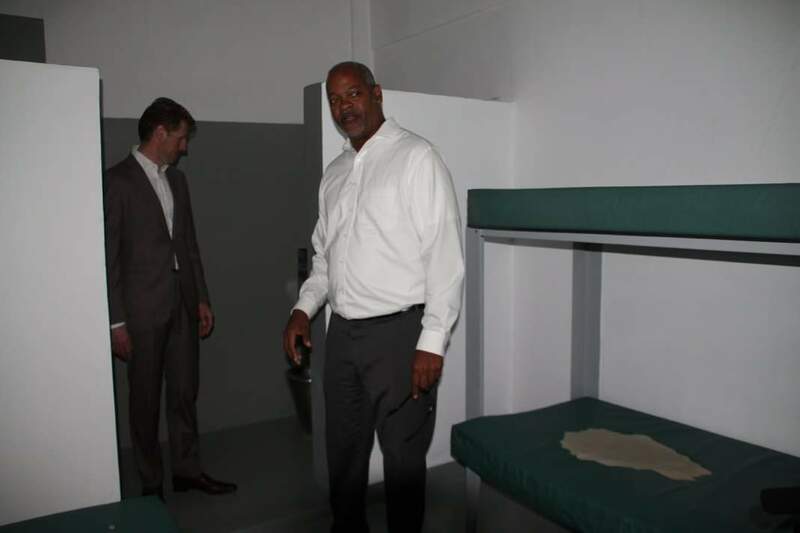 Justice Minister Cornelius de Weever (Right) shows Dekker the recently refurbished holding cells at the Philipsburg Police Station. De officiële woordvoerder van de Raad van Ministers van Europe spreekt op de nieuwssite Koninkrijksrelaties.Nu tegen dat er een besluit is genomen over het eventueel onder ‘intensief toezicht’ plaatsen van het Koninkrijk. Het verweerschrift van het Koninkrijk is pas vorige week ingediend en moet eerst worden bestudeerd voordat de Raad een standpunt inneemt. Daar gaat, zo zegt de woordvoerder, nog maanden duren. Het bovenstaande bericht uit de Daily Herald – dat overigens kennelijk zonder te checken is overgenomen uit de Amigoe van zaterdag – is dus fakenews. Dit bericht werd geplaatst in _Nederland, _Sint Maarten, Dossier KFO, Goksector, Onderzoek Catfish-Larimar, Onderzoek Diamond, Politie & Justitie, Politiek, SXM-Daily Herald. Bookmark de permalink . Kijk de stakker in de mist Peppie lopen met zijn lege recht zaken ordner, deze twee recht zaken had ik ook gewonnen zonder een advocaat in de hand te nemen, dit waren toch zaken die bij voorbaat al bekend waren en het OM bewust op de koop toe heeft genomen, het OM had weinig tot geen zin om deze vlegel Corallo in een hotelkamer op te sluiten in een gevang in NL, die vlieger ging ff niet op, weet je hoe slecht je zit in een politie hok, heel slecht geloof mij maar en ik kan het weten?.